On June 27, Skinner's Fine Jewelry sale will feature pieces from the estate of Susan Freeman, renowned collector of jewelry and couture. 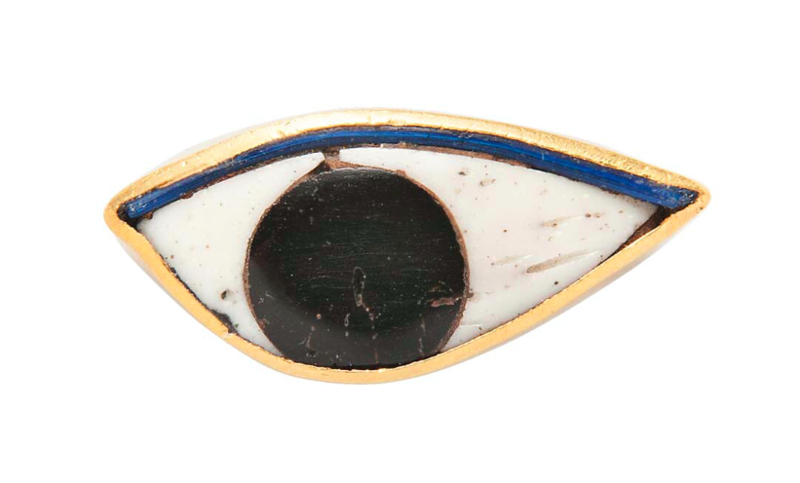 14kt Gold and Faience Brooch, Ed Wiener, c. 1970, centering an Ancient Egyptian faience eye, wd. 1 1/2 in., signed. New Yorker Ed Wiener began his career in post-bauhaus Provincetown and Greenwich Village in early days of the Abstract Impressionist movement of the late 1940s. Born in 1918, Wiener worked in his father's butcher shop until the war. During the WWII, he worked on a radio assembly line, where he realized he his talent for crafts and using his hands to create objects. 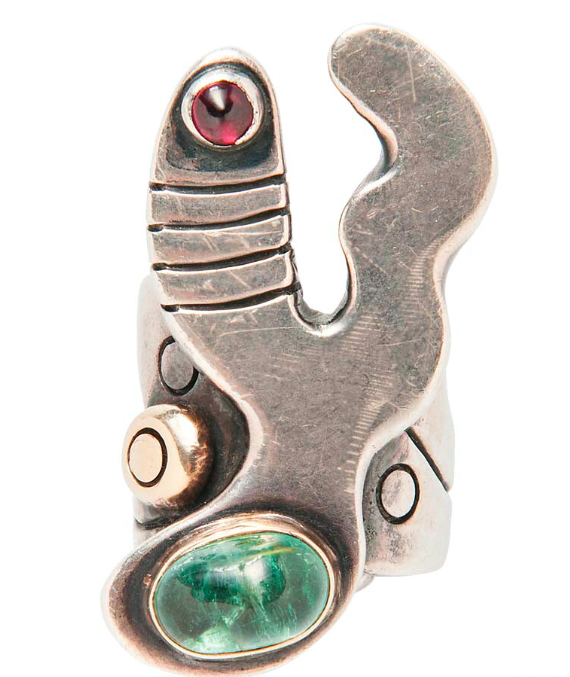 Weiner learnt jewelry making using plumbers' and carpenters' tools. Picasso's sculptural forms were a source of inspiration for Weiner. He began creating designs in silver, once explaining how silver is ''a noble metal...It'll be beautiful in spite of most things you can do to it.'' He worked with silver until late 1950s, when he moved on to gold and precious stones. Calder's mobiles also influenced Weiner's work. The art and music of his time and New York city were weaved into Weiner's works. He once compared jewelry design to jazz improvisation, where pauses are as important as the notes, reflected in Weiner's use of space in his pieces. Weiner had a studio on 5th Avenue where he worked until his passing in 1991. 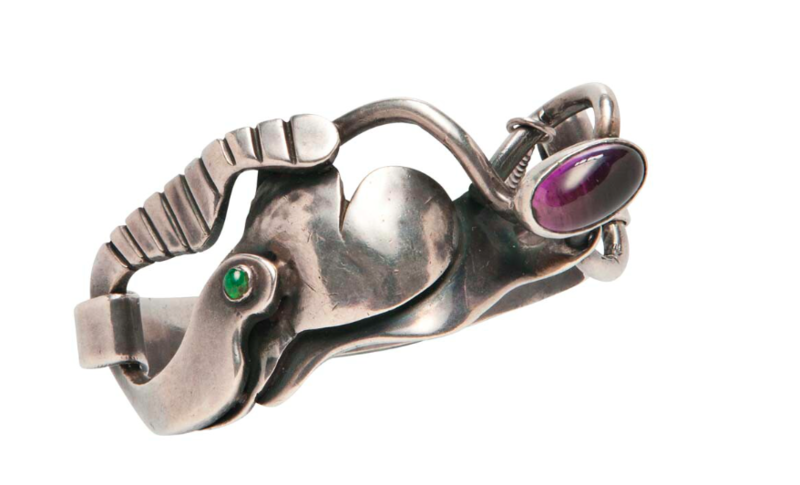 Pittsburgh-native Sam Kramer reinvented modern jewelry during the mid-20th century. His studio and works were as much a part of Greenwich Village's beatnik scene as Jack Kerouac and Bob Dylan. In 1939, he opened the doors to his surreal studio in Greenwich Village. His clients were first greeted by a hand-shaped front door handle customers had to ''shake'' to enter the studio, where Kramer would be working, sometimes in his pyjamas. His jewelry designs were as surreal as the works of Dalí or Man Ray, Kramer would feature the most unconventional materials in his designs such as: taxidermist eyes, moose teeth, porcupine quills, fossilized sea-insects and ancient coins. 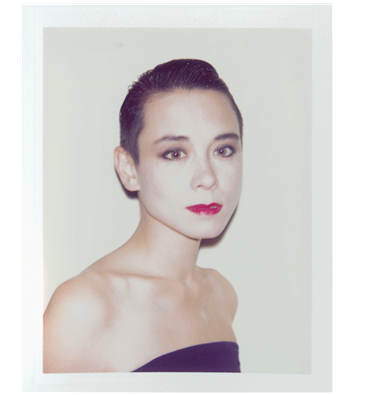 In the 1970s and 1980s, there were not many artists or designers that didn't count Tina Chow as a muse. Born in Ohio, the daughter of an German-descent American father and Japanese mother, Chow's family moved to Japan in the mid-1960s. In Japan, Tina and her sister were scouted by a modelling agency. The two became the faces of Japanese cosmetic line Shiseido. Helmut Newton, Cecil Beaton and Arthur Elgort are just a few photographers who shot Chow during her career. Warhol captured her behind his lens, whilst she was a muse to Yves St. Laurent and Issey Miyake. In the late 1980s, Tina began to create her own jewelry line. In 1987, her first collection was sold at Bergdorf Goodman in New York, Maxfield's in Los Angeles, Ultimo in Chicago, and Gallerie Naila Monbrison in Paris. 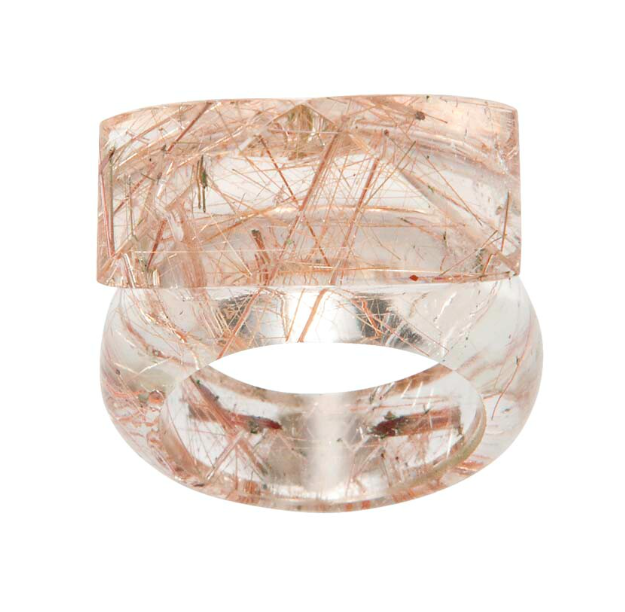 The collection featured pieces made of rock crystal, gold, silver, wood, bamboo, and silk cording. 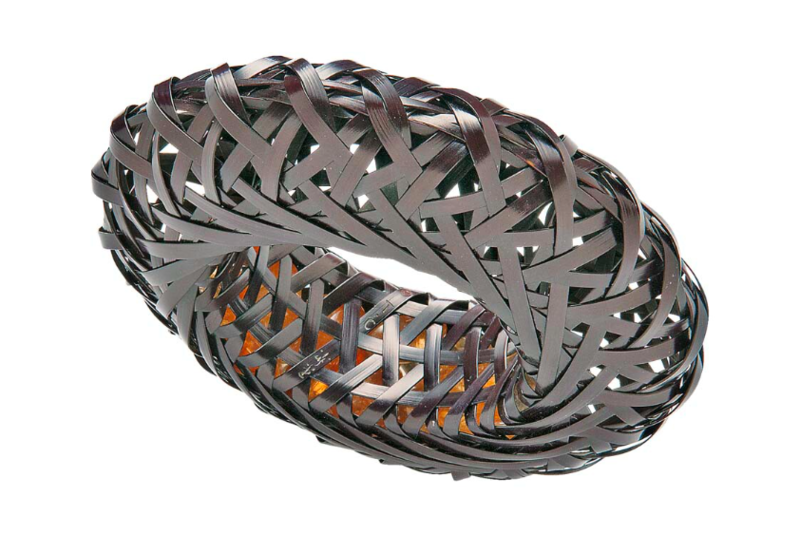 The most iconic of Chow's designs was the Kyoto bracelet, a woven bamboo bangle which encases rough rock crystals or rose quartz in their natural form which move with the wearer. The bamboo wrapping and basketry work was the skill of Kosuge Shochikudo, one of Japan’s master craftsmen in the art of bamboo. All jewelry pieces will be featured in Skinner's Fine Jewelry sale on June 27, 2017. Check out the full catalog here.